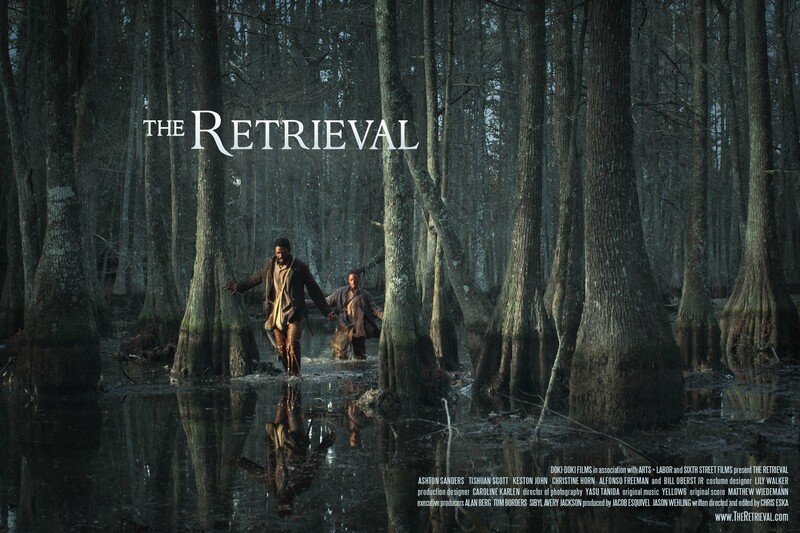 The Retrieval is a period drama set during the Civil War, but the politics and action of that time act more like a force of nature in the movie than a setting. The main characters are forced to circumvent it whenever possible, both for their safety and to avoid any diversions from the main morality play at the film’s core. Filmmaker Chris Eska has said in interviews that when he originally conceived of the story, it was going to be set on the US-Mexico border, playing off of the momentum he earned with his first film, August Evening, which was shot in Spanish and set in Texas. The Retrieval’s premise is one that could easily be transplanted into many historical circumstances. While the Civil War setting gives the film a strong aesthetic in costumes, language, and the beautiful settings in the woods, the issues that provide the backdrop are painted quite flatly. The film is centered around a teenage boy who is exposed to various men’s methods of survival and justice. Will is under the tutelage of Marcus, an older con man, and they are both employed by a cruel bounty hunter who uses them as bait to capture runaway black slaves. This bounty hunter presses the two of them into a long journey to bring a freed slave, Nate, back to the South. They're to lure him with news of his dying brother. The ease with which Marcus and Will are able to find Nate is the first sign that coincidence will have a heavy hand in determining the course of the movie rather than the character’s choices. Once Marcus and Will convince Nate to travel with them back south, the two older men’s attitudes about right, wrong, and survival clash, often with direct regard to how Will should or shouldn’t act. A dichotomy is set up between the two men: both have been made hard by the events in their lives, but only one of whom is willing to undertake betrayal for a living. While Tishuan Scott ably plays Nate as the quiet badass who would prefer not to have to resort to his deadly skills, his motivations for doing anything aside from looking out for Will are never fully explained, and his vague back story could have benefited from even one solid monologue about what separates his current condition from his past. We're given no reason why he is willing to risk his existence as a free man to see his dying brother, especially when the woman he's been separated from for five years also gets wedged into the situation. All we really know for sure about Nate is that the hand axe he keeps pulling out and sharpening is going to find someone's back, and no amount of lightweight character exposition is going to take our minds off of it. In fact, the whole middle of the film is a chain of encounters and scene padding that serve no purpose other than to draw Nate and Will closer together as we head toward a predetermined showdown. All the side characters the men come across either play to a simple type or change their attitudes so quickly that they’re easily forgotten. If the movie didn't keep up its constant poker face, the messy mechanisms of the story would be more than detrimental, but there is one thing The Retrieval does well, and that's act very serious for ninety straight minutes. The movie doesn’t care if it has weak cards, it’s going to play like a grave-faced, unbeatable gambler that hates to fold. In films like this, the audience is left grasping for anything to hold on to, any entry point of empathy or aspiration, and so it falls to Will, the teenager who learns the freedom of choice between right and wrong, to engage us. Fortunately, Eska found a young actor talented enough to lift scenes and not steal them in Ashton Sanders. His face is where we look first for reaction and emotion in the midst of everyone else’s clenched jaws. A film that expects its audience to fill in its own blanks based on what they already know about slavery, race, and geography is going to get a wide range of reactions. Some won’t mind the plot that’s more of a bell curve than arc, especially since it is so beautifully shot. But those of us who hoped for a film that might provide a blend of movie drama and exposition on the dilemmas of free blacks during an intense historical period are left to wait a little longer.